Didot, Ambroise, Hyacinthe & Frédéric (Librairie de Firmin Didot Frères), active 1827-? Les ruines de Pompéi, par F. Mazois Architecte, Inspecteur Générale des Batiments Civils, Chevalier de L’Ordre Royal de La Légion d’Honneur. Première Partie [title in volume iii: Les Ruines de Pompéi, par F. Mazois… Et Continué par M. Gau, Auteur des Antiquités de La Nubie. Troisième Partie; title in volume iv: Les Ruines de Pompéi, par F. Mazois… Ouvrage continué par M. Gau, Architecte, Précédé d’Une Notice sur F. Mazois, par M. Le Cher Artaud, Membre De L’Académie des Inscriptions et Belles-Lettres, et De L’Explication de La Grande Mosaïque Découverte a Pompéi en 1831, par M. Quatremère de Quincy, Secrétaire Perpétuel de L’Académie des Inscriptions et Belles Lettres… Le Texte de la Quatrième Partie a été rédigé par M. Barré, Professeur de Philosophie. Quatrième Partie]. I: (32) ff. letterpress, signed π1 (half-title, Première Partie) 2π1 (title) (1)–301 and paginated (4) 1–59 (1), with engraved vignette on title-page and twelve vignettes printed with text (list pp.57–59); plus engraved title-page (lettered Les Ruines De Pompei Dessinées Et Mesurées Par F. Mazois Pendant Les Années mdcccix – mdcccx – mdcccxi Publiées A Paris En mdcccxii) and forty engraved plates (numbered i–ii, i–xxxviii), of which the last is double-page (list p.). II: (55) ff. letterpress, signed π1 (half-title, Seconde Partie) 2π1 (title) (1)–531 and paginated (4) 1–104 (2), with engraved vignette on title-page and twenty-two vignettes printed with the text (list pp.101–104); plus fifty-eight engraved plates (numbered i–iii, i–lv), of which two are folding (pls. xliv, xlviii). III: (40) ff. letterpress, signed (1)–401 (including half-title, Troisième Partie; and title) and paginated (1)–79 (1), with engraved vignette on title-page and twelve vignettes printed with text (list pp.78–79); plus fifty-three numbered engraved plates (numerated i–l, ix bis, xiii bis, xiv bis), of which four double-page or folding (pls. iii, ix bis, xiv, xxiii), and eight coloured by hand (pls. xxi, xxvi, xxvii, xxxvi, xxxvii, xlv, xlvi, l). This copy contains a second impression of plate xiv bis in a previous state (where wrongly numerated xvi bis). IV: (52) ff. letterpress, signed π1 (half-title, Quatrième Partie) 2π1 (title, dated 1838) a–c1 (Notice sur F. Mazois) (1)–461 (47)1 (Avis au Relieur) and paginated (4) i–vi 1–91 (3), with engraved vignette printed on title-page; plus folding lithographed map (Plan général de la ville de Pompeia, dated 1837) and fifty plates (numerated i–xlix, xlviii bis), of which three are double-page or folding (pls. xix, xxxvii, xlv), and nine are wholly or partly coloured by hand (pls. i, xxi–xxiii, xxvi, xxxix, xlii, xlviii bis, xlix). Occasional foxing, particularly to tissue interleaves; otherwise in excellent state of preservation. bound uniformly in contemporary russia leather, dyed purple, engraved ticket in upper corner of pastedown Gebunden bei Ph. Selenka in Wiesbaden (volumes i–iii). Very fine copy of a scholarly and thorough archaeological study of Pompeii, intended by its author as the beginning of a series on Paestum, Herculaneum, and Pozzuoli. 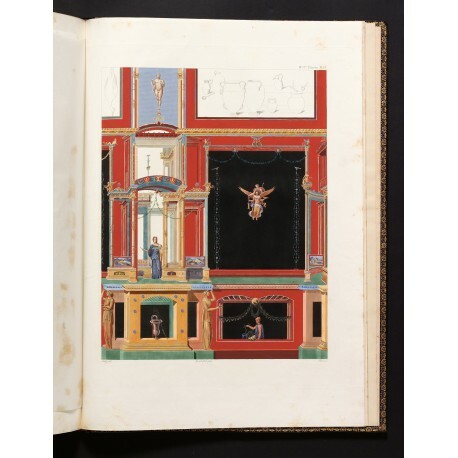 After studying for a short time in the studio of the architect Charles Percier, Mazois had travelled to Italy in November 1808 with a fellow-student, Achille Leclère, winner of the 1808 Prix de Rome for architecture. Through the agency of Etienne-Chérubin Leconte (1762–1818), architect to Carolina Murat, Queen of Naples, Mazois was appointed dessi­nateur de son cabinet, and afterwards gained access to the excavations, still jealously controlled by the Naples Academy. From 1809 to 1811, he resided in the ruins, making hundreds of drawings. At the beginning of 1811, Mazois returned to Rome, where he apparently supervised the engraving of some of his drawings, and proceeded thence to Paris to prepare the text. Owing to political circumstances, Mazois could not return to Naples until 1816, and then his visit was restricted to a month; in 1818 he was able to remain for nearly a year; his final visit, in 1819, was again very brief. A prospectus inviting subscriptions to the work was published in December 1812,1 and the first fascicule appeared in January 1813, distributed by the booksellers M. Leclerc, Didot l’aîné, and Normand, on two papers: papier ordinaire and papier fin (i.e. vélin), each livrai­son priced respectively priced 20 and 30 francs.2 Further fascicules, often containing fewer, or more, than the prom­ised six plates, appeared thereafter at irregular intervals. In 1824, they were gathered up, and issued as two volumes. This copy contains a leaf of dedication in volume i addressed ‘A sa Majesté La Reine Des Deux-Siciles’. The leaf is present also in the copy in the British Architectural Library, but is lacking in the Royal Academy Library copy: ‘If this was to Napoleon’s sister, Caroline, this dedication page may well have been omitted from sets of plates distributed after 1813, when she was evicted from Naples’ (opac of Royal Academy of Arts). 1. Bibliographie de l’Empire Français ou, Journal général de l’imprimerie et de la Librairie, 18 Decem­ber 1812, p.793 no. 5153. 2. The first fascicule was reviewed in Le Moniteur Universel on 17 January 1813 and in Journal de l’Empire on 9 August 1813; an announcement for the fourth fascicule states that the edition numbered 500 copies (Bibliographie de l’Empire Français ou, Journal général de l’imprimerie et de la librairie, 21 January 1814, p.17 no. 123). André Monglond, La France révolutionnaire et impériale: annales de bibliographie méthodique et description des livres illustrés, ix: 1811–1812 (Paris 1963), pp.910–911. 3. Louis Barré, in the preface to his Herculaneum et Pompei: recueil général des peintures bronzes, mosaïques etc. découverts jusqu’a ce jour (Paris 1839–1840), p.xiii, states that he completed part iv. Halsted B. Van der Poel, Corpus topographicum pompeianum, Pars v. Cartography (Rome 1981), pp.xxxvii, xxxiii, 99, 188–191; Jocelyn Bouquillard, ‘Les Ruines de Pompei de Mazois, genèse d’une publication archéologique au début du xixe siècle’ in Nouvelles de l’estampe 181 (2002), pp.17–29. 5. 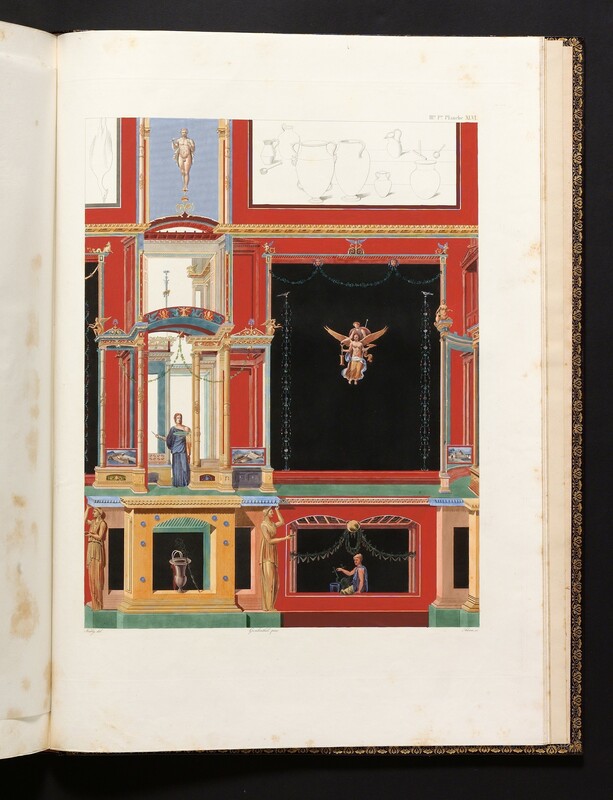 Mazois’s drawings were donated by his widow (née Jenny-Malvina Duval, daughter of Alexandre Duval of the Académie Française) to the Bibliothèque Nationale de France in 1861 (Estampes, G.d.12.d-g); see Sergio Villari, ‘Disegni e manoscritti di François Mazois nella Bibliothèque nationale di Parigi’ in Disegni d’archivio negli studi di storia dell’architettura (Naples 1994), pp.150–153; Jocelyn Bouquillard, La résurrection de Pompéi: dessins d’archéologues des xviiie et xixe siècles (Arcueil 2000), pp.28–31. 6. Bibliothèque Nationale, Inventaire du fonds français après 1800, ix (Paris 1955), p.425; Allgemeines Künstler-Lexikon, 63 Munich 2008), pp.254–255. 7. Bilder aus Pompeji: Antike aus zweite Hand: Spuren in Württemberg, catalogue of an exhibition in Alten Schloss, Stuttgart, 23 October 1998–11 April 1999, edited by Marion Mannsperger and Joachim Migl (Stuttgart 1998), pp.79–81 no. 6. 8. 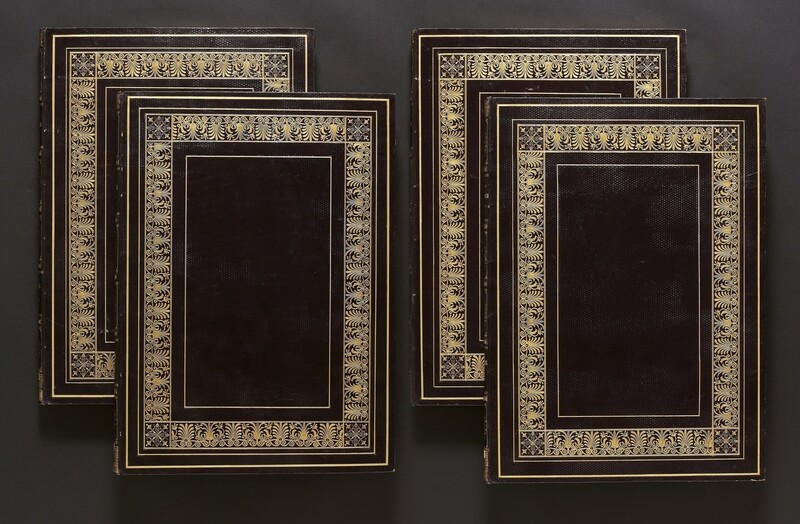 Two bindings by Philipp Selenka in the Fürstlich Waldecksche Hofbibliothek, Arolsen, are descri­bed by Rudolf-Alexander Schütte and Konrad Wiedemann, Einbandkunst vom frühmittelalter bis Jugend­stil aus den Bibliotheken in Kassel und Arolsen, Universitätsbibliothek Kassel (Kassel 2002), p.54 no. 68 and Abb. 51. He was a specialist ‘Portefeuillear­beiter’; see Hektor Rössler, Ausführlicher Bericht über die von dem Gewerbverein für das Großher­zogthum Hessen im Jahre 1842 veranstaltete Allgemeine deutsche Industrie-Ausstellung zu Mainz (Darmstadt 1843), p.240.